Perfect for the golfer who is trying to simplify their golf game. All Teecils are 3¼" long in a natural wooden body with our tag line and web site. 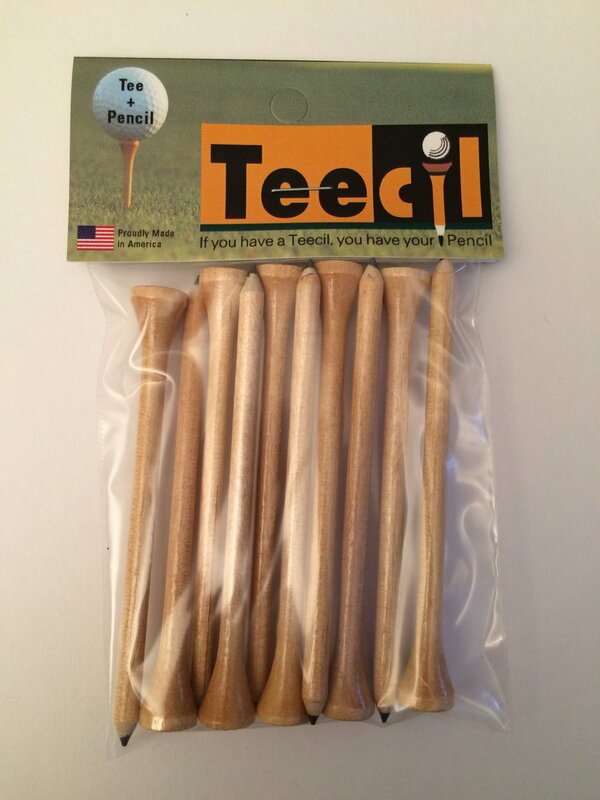 Teecil Packs come in bags of 5, 10, 50, or 100. They can also be bought in bulk quantities of 500 or 1,000. Personalized Teecils are available in 7 body colors and customized with up to 3 lines of printing or your logo. Limit of 22 characters per line. Packaged in bulk. Minimum quantity for personalized Teecils is 250. Bag of ten personalized Teecils come with a personalized card topper. This is a perfect promotional item for golf tournaments or company gifts. Minimum quantity is 100 packs of ten. Personalized golf tees in the body color of your choice on a personalized business card. Use them for sales meetings, product announcements, promotional events, golf tournaments, fundraisers or special events. Minimum quantity is 250 cards. Personalized match books come with four Teecils. This is a great item for tournaments or a stand alone promotional item. Minimum quantity is 100 match books.